At my desk in the design office, I'm fortunate to have the advantage of listening into Jane Cleal's theory sessions with the students. One of my favourite challenges Jane sets the students is the £50 project. The brief is to design an item that can be replicated 20 times in 20 hours. Each item should aim to achieve £50 from a buyer. It is an exercise in designing for simplicity and batch production, market research in terms of what a buyer would consider worthy of a £50 price tag and whether the item should best appeal to need or aesthetics, and budgeting and costing. At the end of the project, the other students each vote on whether they think a buyer would pay £50 for the items designed. It is so much trickier than it sounds, but I'm always impressed with the ideas that come up - and I of course like to join in with the end votes! We've had cake stands, book rests and spectacle stores, mud kitchens, guitar stands - all sorts! Ben, Toby and Mark are pictured here with numerous ideas in their sketch books. I can't wait to see what they have come up with. Congratulations to Wilma and Henry for Securing Jobs at Artichoke Ltd.
Today, our student, Wilma Wyatt starts her new job at Cheddar based fine bespoke furniture and interiors company - Artichoke Ltd.
Our student, Henry still has another month of his course to finish, but will join Wilma at Artichoke in May. For those students who would like to pursue a route to employment, we will give you support in finding the role and employer that is right for you. Not all students will know exactly what they want to do, or where they might like to work when they first begin the course, but that is something we will help you research and explore in your time here. We'll use our knowledge of South West and UK based bespoke furniture companies to suggest furniture companies and workshops that might be of interest to you. When Wilma began at Williams and Cleal, she had no previous woodworking experience and she leaves the course at a competant designer/maker. We couldn't be more proud of her for securing a job with Artichoke and we wish her all the best for her future. Congratulations to past students Maria Del Mar Gomez and Charles Byron, whose work has been featured in the Sunday Times Home section. 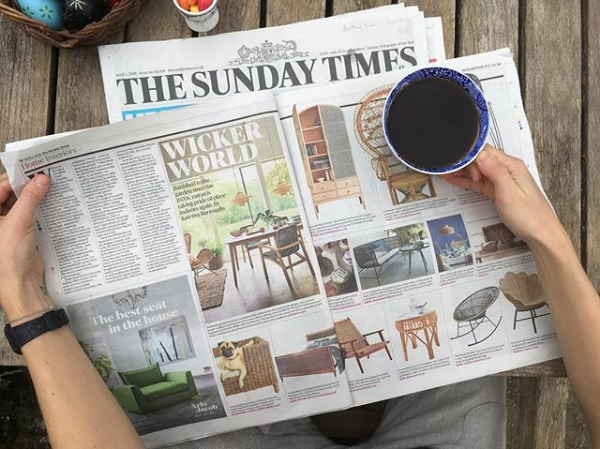 As part of a feature on wicker furniture, Byron and Gomez's Patria Cabinet was selected by the Sunday Times amongst several other pieces from makers showing how rattan is taking pride of place indoors again. How Did We Do? Reviews of our short furniture making courses. It's good to know when you are doing things right, and even better to know that the teaching we have delivered, has inspired and motivated students to go on and do more! In addition, Gordon has decided to take advantage of an option that we offer to all those on our one week courses. If after your week's course with us, you decide that you'd like to go on and enrol in our one year furniture designer maker course, we will offset the fee that you have paid for the week's course, against the cost of the one year course as a thank you! As such, Gordon starts his full time course with us in May, and we are delighted to welcome him back. So over to Fung, Heather, Julian, Paul and Gordon for thier feedback on our Introduction to Fine Furniture Making Course! "Fantastic beginner's course with well thought-out projects. Students are mentored individually to develop at their own pace. Woodworking skills are gradually instilled by experienced tutors in a modern and well-equipped facility. Highly recommended for anyone serious about woodworking!" "I did the one week introduction to fine furniture making. It is a fantastic course for both beginners and experienced woodworkers. Students are given a clear, well thought out project, designed to learn basic hand tool skills and put them into practice. Justin was extremely knowledgeable and patient - especially with us beginners! At the end of the 5 days a beautiful piece was created which highlighted our new and amazing woodworking skills. Thank you so much for a fun and enjoyable week and helping me learn some great new skills." "W&C have a great setup for training, with a large, well-stocked workshop. I did the one week introduction course, which covered a lot of techniques without being overwhelming. Justin is a great teacher and I would highly recommend the course." "Just completed the one week introductory course and it totally exceeded my expectations. Wanting to get into fine woodwork Justin proved to be the perfect tutor with an obvious mountain of knowledge and skills, ensuring once shown how to each individual was mentored on the hands on elements. The course content and pace was also spot on with the benefit of a completed project at the end. The workshop environment completed the package which I would highly recommend to anyone interested into fine woodwork. It has given me the basics needed and definitely ignited a desire to hone skills learned." The joy of a log burner in the middle of the workshop during cold weather is not to be underestimated. The 'Beast from the East' arrived during the week but Justin was really flexible in helping us all finish the project in spite of the fact that some people needed to return to other parts of the world whilst most of us couldn’t get near the workshop because of the deep snow." If you'd like more information or an informal chat about our courses, please feel free to call the office. The Beast From the East and the return of our one week introduction to fine furniture making students. This week, we welcome back three students from our February One Week Introduction to Fine Furniture Making course - Julian, Heather and Gordon. The Beast from the East winter storm tried... and succeeded in snowing off two days of the course in February. However, whatever the weather, our tutors were keen that the students didn't miss out on any of their training. So we welcome them back to continue their course - and finish their tea tray project at the school this week. We look forward to posting their finished projects on Friday! Functional Furniture: Bespoke designs by our past students in the press. Two former students, Charles Byron and Maria Del Mar Gomez met while on course at Williams and Cleal. Three years ago, Maria and Charles began their business, Byron and Gomez, in the school's incubation workshop just up the road. Since beginning their business, they have been a perfect role model on how to grow a successful furniture start up. Not only has their work been acknowledged for a bespoke guild mark, but they have been selected amoungst tough competition for the Crafts Council Hothouse Programme, and won and been shortlisted for numerous awards. The creative process begins with a purpose (a chair, table, cabinet) and then they both draw separate designs for each other to critique. "We have to be completely honest about what we think of each other's designs and if we can't agree then we have to put the design on hold for a while. Then we will usually come up with a third solution which is better than either of our intial ideas"
The article features their beautiful Lunas lamp, Patria Cabinet, Eleanor Coffee table and Penumbra sideboard. It also charts their story.....from meeting at Williams and Cleal through to building their successful bespoke furniture business together. It's also a very honest account of the challenges and rewards of creating your own furniture business. While acknowledging the isolation of lone working that can come from small business situations like this, Maria balances this with the freedom and pleasure of being makers and designers - and the excitement of being a master of your own fate. Does veneer deserve it's bad reputation? Solid wood Vs veneer! Does veneer deserve it's bad reputation? For some there is a stigma surrounding veneer, and a belief that furniture made from it, is something to avoid. This rather unfair perception is often not helped by the adverts we see on television, which can also be unfavourable towards veneer. The negative associations with veneer started after World War II. Good timber was difficult to obtain and was often expensive. The use of veneer was a cheaper, available alternative. However, the adhesives used for attaching veneer to wood or chipboard was poor at that time and resulted in an inferior performance and finish. Veneer’s reputation was further damaged in the 1970’s, when some cheaply produced veneers meant that it became synonymous with inferior quality. Very cheap furniture, was also often not even made from wood veneer – but instead a laminate material or paper (foil), a faux surface that contributes to giving real wood veneer it’s bad rap. Trying to turn that tide of opinion has been hard – I can still hear the advice of my parents ‘Always buy solid, never veneer’ passed down through generations , but lets look instead to the huge benefits and quality that the use of veneer can bring. On quizzing our tutor Justin about veneer, there are many positive reasons for using it - not least because nowadays the very highest quality logs are sold to veneer merchants. Veneer merchants have very exacting requirements and look for logs that are uniform in colour, have uniform growth rate, centred pith, no shake or mineral streaks or stains and nominal external defects. A good deal of high end furniture is now made from veneer - partly for the reason that the quality of the wood used for the veneer is of the highest grade, but also for reasons of design, minimal movement and availability of exotic and unusual timbers. Veneers can also have a specific purpose, i.e. helping to keep a wood panel stable as it can’t move when glued to a substrate. Solid wood, even kiln dried, is subject to expansion and contraction as the wood continually changes with the amount of relative humidity in the surrounding atmosphere. Wood moves as its moisture content varies, swelling as it absorbs moisture and shrinking as it releases moisture. The grain structure causes wood to move differently in three directions. Wood will move much more across the grain, tangentially along the growth rings; but there will also be some movement in the radial direction, and a very tiny amount longitudinally. This movement will also happen in veneer, but since veneer is much thinner than solid, the movement is minimal; and the expansion and contraction is limited by the relative smaller mass of the leaves of veneer compared to solid. In one of the pictures above, you will see a beautiful round Rippled Sycamore and Maple table made by Williams and Cleal – the radial design would be impossible to create in solid wood because the joints would crack open in dry spells and swell tightly shut when damp. Since the veneer used for this table is thin and glued to a substrate, it allows for this design and arrangement of wood, producing a surface that is no longer prone to warping, splitting or seasonal movement. Working in solid wood is lovely, but it can some times be restrictive in terms of design. Veneer is more forgiving with regards to movement and therefore increases the range of design possibilities. This has even greater significance with rare, or endangered wood – such as Macassar Ebony or Rosewood – which would be hard and very expensive to acquire in solid, but more accessible and affordable as veneer. It’s possible to find many more species of wood in veneer than found in solid, lending furniture makers more variety in their choice of materials. Furthermore veneer merchants who are unable to source a species which is either certified or sustainable, can produce replicas (usually made from Ayous or Poplar), which have been colour stained or processed to look incredibly close to a number of species. Tabu are a company that are leading the field in this area. Veneers are also essential for special techniques such as book matching and marquetry. This is achieved by using consecutive leaves cut from one log that perfectly book-match. Equally, veneering gives opportunity for generating a pattern in furniture like slip-matches and radial patterns. Diamonds and more complex shapes can also be generated using marquetry and parquetry techniques. We are advocates of using both high quality veneer and solid wood at Williams and Cleal, and we encourage our students to explore the value of both veneer and solid wood in equal measure. The material that our students choose is thus often dictated by the requirements of each individual design. To see more of our students work, please view our gallery at www.williamsandcleal.co.uk or for more information on veneer, we recommend visiting www.mundyveneer.com. We are really pleased to welcome our six new One Week Introduction to Fine Furniture Making students to the school this week. The students, hailing from both local and international destinations, from Borneo to the US have come - largely as complete beginners -to learn about the sharpening and use of hand and measuring tools, understanding basic workshop drawings, techniques for chiselling and planeing, timber selection and identification and understanding basic joints. Our new tea tray project will put them through their paces on cutting accurate and sharp dovetails, and at the end of the week they will have produced this item to take home with them. It's a project that draws in all the new hand skills and techniques that they will have learnt during the week here. 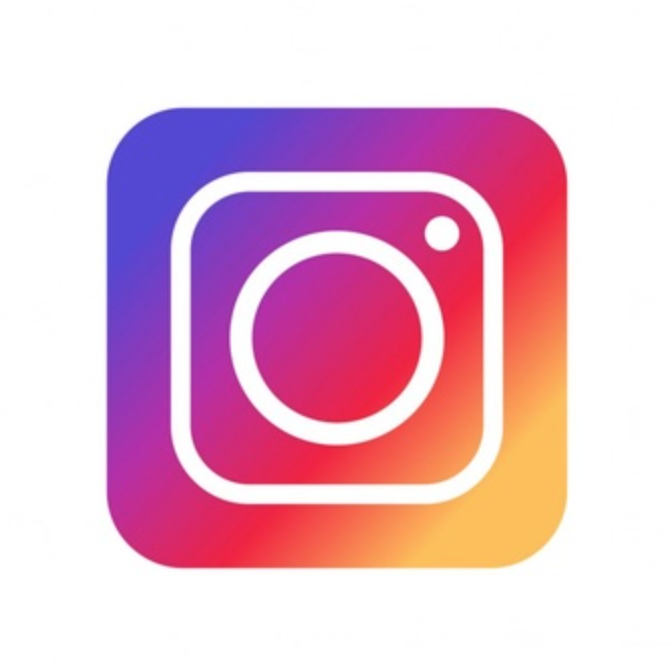 You can follow more of their progress on our instagram and facebook pages. Throughout the year, we like to take our students offsite on trips that will enrich their learning and understanding of timber, materials, cabinetmaking and the bespoke furniture industry. A particular favourite is a trip to Vastern Timber in Wiltshire, the countries largest and most established hardwood sawmill. Vastern's Timber is a family business, owned and run by three members of the Barnes family; Peter, Jon and Tom. 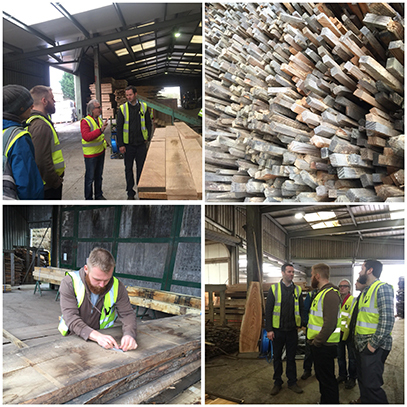 Yesterday, Tom Barnes took time out of his day to show our students around Vasterns and to share his incredible and detailed understanding and knowledge of timber with us. We always look forward to a visit to Vastern's, as the information that we learn there is always incredibly interesting and valuable to us in terms of understanding and selecting the best wood as furniture makers. Vastern's timber have four log-converting bandmills, computer controlled drying kilns and well equipped machining faciliities; which enables Vasterns to process both hardwoods and softwoods and they cut and process their own logs. This means that they can offer a range of species, grades and specifications that may not be available at other merchants. A trip to Vasterns is also a great opportunity for our students to stock up on materials for their upcoming projects. Henry had the opportunity to select and check several boards of Olive Ash for his Sam Maloof inspired rocking chair - and came back to the workshop with a car load of beautiful timber to get started on. For more information on other trips that we run to compliment learning on our Furniture Designer Maker Year long course - please feel free to contact the office for an informal chat. We are excited to read student, Jan Lennon's, gallery article in issue 268 (March edition) of Furniture and Cabinetmaking Magazine. Jan has written a feature piece on how she made her 'Meala' dressing table, her final project on our 40 week course. Jan's dressing table is an incredibly successful piece from design through to final product. Jan joined us from a background in CGI and product design, and from day one, her ability to use drawing and 3D visualisation software to develop and plan her designs has led to some seriously impressive designs. Jan's attention to detail, natural flair for design and inquisitive nature about a variety of technologies enriches her design make projects - which are of a very high standard. Jan's 'Meala' dressing table demonstrates high level cabinetmaking and is a testament to the making precision and high quality skills that Jan has developed in the last year. Made out of American Walnut and Olive Ash, it has a tambour style detail on the front rail. The 'Meala' table demonstrates a multitude of processes in one project, with a lot of work going into creating curves, seen on many components of the table including the shaped legs and main body of the piece. Jan and some of our other students have been invited to write about their making experiences by Furniture and Cabinetmaking magazine - we we greatly encourage. Not only is this a fantastic opportunity to share the project with the cabinetmaking community, but it is great publicity, especially for students like Jan who are going on to create thier own furniture buisness start up. If you'd be interested to read more about Jan's experience of making the 'Meala' dressing table, please grab yourself a copy of the March issue of Furniture and Cabinetmaking Magazine (Issue 269). Woodturning is a unique and useful skill in the world of woodworking. There will always be projects that call for shaped timber detailing – even if it’s something as simple, or low key as some feet for a grandfather clock, or hand turned fixings for an occasional table. Woodturning is a challenge that some of our students choose to master, and as I write this, our student Henry is using some time in the workshop to turn some bowls. Any beginner can learn the basics of the process - and in a couple of hours - have something to show for their efforts. Henry learnt woodturning after a couple of sessions at the school with our tutor Jim; and student, Maurice learnt to wood turn fixings for his small glass table with our visiting tutor, Maria. While woodturning isn’t a subject that we cover in great depth in our syllabus, a great advantage of our course is that our tutors are flexible and reactive to subjects that the students want to cover. So if woodturning, or gold leafing (for example) are something you want to become skilled in - then we’ll go the extra mile in demonstrating that technique to you and helping you to learn about that subject in the depth that you’d like. Henry’s growing woodturning experience is very beneficial to his current project. The grandfather clock requires a variety of shaped features in the form of feet, columns and mouldings – and Henry’s next challenge will be turning the columns that will be a decorative support for the face of the clock. A few methods can be used to achieve the shape of these columns in woodturning. However, the one I’ve chosen to feature in today’s blog is a paper joint. In woodwork, when we glue a project up it’s usually forever. However, in some applications it’s useful to eventually disassemble the joint - and this is where a paper joint comes in. Paper joints are a way of attaching a sacrificial piece of waste wood to a piece of work, often for the purpose of making it easier to turn or shape, or protecting a surface that you’d like to remain unmarked by screws. A piece of porous paper, like brown craft paper, is glued between the waste wood and the work, clamped together and the glue allowed to dry. If the turning is thin, some woodworkers use thin 3mm craft card, which separates more easily than paper and puts less strain on your work. Then you work on your piece as you normally would. When your work on the turned piece is complete, you can then separate the two halves by placing a chisel directly on the paper joint and gently tapping. This causes the paper to split and the halves to separate, although it’s important not to pry the joint open, but use the chisel to drive a wedge between the sections. You can then discard the sacrificial piece of wood, leaving you with the required shaped piece for your project. Henry’s grandfather clock columns, while appearing to be cylindrical, will need to have a rebate section cut out of the column to allow them to sit snugly against the clock face. Henry could do this by cutting the rebate prior to turning the wood - and paper gluing a sacrificial section of wood back into that rebate. Henry could then turn his column as he normally would. On finishing turning the column, he could then use the chisel to separate off the paper glue joint and ‘dummy’ wood, giving him a perfectly turned column with a clean rebate section to fit the clock face. After separating a paper glue joint, the piece can then be finished off by simply sanding off any residual glue or paper. Henry has got several columns and mouldings to turn, so keep an eye on Instagram to see his woodturning skills come together and the progress of his grandfather clock. Link here. We encourage our students to learn about and work with a range of sustainably sourced timbers. We’ve had students using more unusual timbers like Zebrano, Brown Oak, Wenge and more recently…Thermo Ash. Thermo Ash, is Ash that has been modified by the process of Pyrolysis (Heat Treatment). Typically, modified woods like Thermo Woods and Accoya are used for external applications such as cladding and decking – and that is because the modification process fundamentally changes the properties of the wood to great benefit. Wood is by nature, a biodegradable and dimensionally unstable material, but the process of modification changes that. Modified wood has greater durability, resistance to swelling and shrinkage, and increased hardness (and therefore greater resilience to wood boring insects). The acetylation process also reduces moisture in the cell wall to the point where there isn’t enough to support fungal decomposition. In addition to this, the process of treating the wood at high temperatures (in the absence of oxygen to prevent burning) means that the higher and longer the heat, the darker the wood becomes throughout. This can give native woods, the look of desirable imported timbers. For our student Mark, the initial attraction to using Thermo Ash was simply that it was a timber that was new to him – but also because he wanted his small occasional table to have a darker colour timber– similar to brown oak or walnut. Thermo Ash fitted the bill nicely. However, the benefits, as mentioned above were also attractive in terms of making a durable and lasting piece of furniture. Mark found the Thermo Ash easy to work with, and the timber had a nice fragrance. Due to the nature of the wood being dry from the heat processing, the timber can have a tendency to be brittle if being worked on by hand tools, so Mark found that he needed to take extra care when working with hand skills. For the same reason, it isn’t best suited to larger weight bearing pieces of furniture like chairs, but it is perfect for small occasional tables like the one Mark is making. The February 2018 issue of Furniture and Cabinetmaking Magazine features a gallery article on the winning entries for the annual Wood Awards. - of which Williams and Cleal student - Damian Robinson won the People's choice award for his Hex Drinks cabinet. The Hex Drinks cabinet was Damian's final project on his 40 week course with us. The inspiration for the Hex Drinks Cabinet comes from the colour and uniformity of bees’ nest found in the maker’s garden. Hand cut veneers in contrasting timbers and grain patterns were used for the honeycomb. The maker laid the veneer hexagons out in sequence while referring to the actual nest. The edges of the doors were designed to meet in a line that followed the interlinking hexagons. The inset brass levers devised to open the doors were made in the same size of the hexagons to mesh seamlessly with the overall design. English bog oak, dating from 3,300BC, was selected to set off the complex honeycomb pattern without interference. You can also see video of the hidden handle on the hex cabinet on our Instagram page. The People's choice award was voted for by visitors to the London Design Fair. Congratulations Damian! Writing the Cabinetmaker’s CV – finding work after your course. Working in a commercial workshop is not the end goal for all our students, but for many, our course is their means to a complete change of career, to earn a living doing something that they love. By the end of your time with us, you’ll know and practice fine furniture making to a professional standard. You’ll even have several beautiful pieces of furniture to feature in your portfolio. This will demonstrate your acquired skills, competence as a maker, and your application and understanding of design. But how do you get that all important job? Well brace yourself for the essential….. but less interesting subject of CV’s and interview techniques. For if you don’t have the skills to get yourself to (and through) an interview, then you could be an excellent maker, but may still struggle to get employment. We all believe we know how to write a CV – but the advice on writing it effectively changes all the time. We only need to look at the internet for an ocean of conflicting advice – some good, but often some really quite bad and outdated. I imagine most of us have fallen victim to peppering our personal descriptions with power words – tired verbs that employers have heard over and over again, to the point where they have lost their meaning. It can also be easy to copy an online CV template – but is the layout and information in that template appropriate to your industry? What do Workshop Managers look for in a cabinetmaker’s CV? What will make your application stand out above others? How can you best come across at interview or in a trade test? Is your portfolio more important than your CV? Jane and Justin have been running the bespoke furniture arm of Williams and Cleal for 27 years and employed numerous makers in that time. As such, they have a wealth of experience and advice to impart to our students on what they look for as employers. 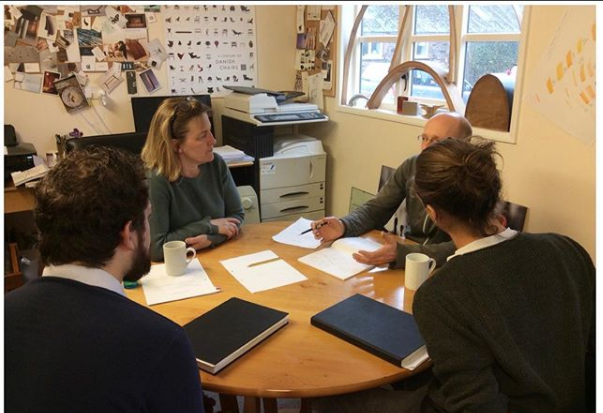 Moreover, Williams and Cleal are part of a focus group of bespoke furniture workshops and employers in the South West, investing time into opening up job opportunities in South West Furniture businesses. We frequently keep our CV, interview and trade test advice current by canvassing the opinion of the Workshop Managers in this group – and pass this onto our students. I will leave you with some CV advice from John Hampton, the Production Manager at Artichoke Ltd – Designers and Makers of Bespoke Interiors and Furniture in Cheddar, Somerset. “With today’s technologies most of the CV’s we receive now are via email, but I still think it’s fine to send a CV in the post. I’m sat here looking at six CV’s of guys that have been taken on here during the past 1-6 years. Three still work here and three have moved on to further their career. They all have particular things in common. Presentation, layout and content make a huge difference when standing out amongst others. They all start with either work history or a personal statement detailing motivations, skills and achievements. I always think it is great to start with a personal statement then move on to work history. A great covering letter is also always important. Also hands down, except one, they all show lots of photographs of work, some show magazine articles, paper cuttings etc. One great CV I have completely stands out amongst the rest is designed and presented more like a website than a CV. There is something to be said for completely thinking outside of the box but remember that an employer is looking for the information they need to know. It definitely makes a difference when CV’s are clear and easy to read. Definitely keep things simple, no guff or fluff and always be truthful. It really is true when they say that first impressions count and decisions are made with CV’s within the first half a page. I also think with today’s social media the options continue to expand. I have had no emailed CV’s yet that link to Instagram, videos, websites, internet content etc. I’m sure this will come. Our students initially undertake several small set projects that teach essential hand/machining and construction methods… but then they move on… with the freedom to create their own projects. It’s always interesting to hear where students draw their design inspiration from. Sometimes student’s designs can be rooted in their cultural background and influences, some have taken inspiration from nature, or a particular designer/artist they admire. On occasion, design might be inspired by the opportunities that new processes and materials provide. In recent years, Japanese inspired furniture design has been popular with some of our students. Last year, student, Alistair Buchan produced his Torii gate table as one of his major projects on the course. A Torii gate is a traditional Japanese structure most commonly found at the entrance of, or within a Shinto shrine, where it symbolically marks the transition from the profane to sacred. In Ali’s side table design, the interpretation of the Torii gate translated well, and the end cleated table top is visually striking. Our current student, Henry, has also just completed a low Japanese style coffee table in Cherry and Walnut. 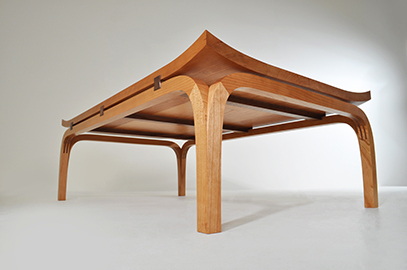 Henry’s design was partly inspired by the Bundai table. A Bundai is traditionally a special Japanese writing table, commonly used at special gatherings for composing renga linked verse, haiku and other forms of poetry. Since Bundai are more emblematic of aesthetic taste than practical in function, they are generally quite lavishly crafted. For Henry, it was the legs of the Bundai table that were of particular interest, as traditionally both the legs and tops are undercut in decorative designs. The legs of Henry’s table are mitred together, a jointing technique that was of particular interest to Henry in making this project. It is a finely executed piece, which is shown by the corner detail and by the underframe reflecting the flair curve on the table top. These details created a considerable challenge in the making for Henry. Japanese carpentry is traditionally intimately bound up with the history of architecture in Japan. The Sashimono-shi are carpenters that craft more general furniture such as chairs, and cabinets, but there are three further woodworking professions who are distinct in the experience with various forms of joinery. The Miyadaiku – carpenters that practice the construction of Japanese shrines and temples (known for their use of elaborate joints to make well-structured and extremely long lasting structures); The Sukiya-daiku, carpenters famed for their delicate and aesthetic constructions such as staircases and window frames; and the Tateguya are interior finishing carpenters who build shoji (Japanese sliding doors). Japanese woodworkers have created aesthetically beautiful and effective joinery, closely related to Japanese architecture, centuries prior to the invention of screws and fasteners. It is the work of tightly slotting together pieces of timber, joinery that does not require materials such as stitching, glue or nails due to the complex carved interlocking wooden joints. Japanese joints are typically durable, tough, visually appealing and efficient on materials. For Ali, the design and making of his side table was directly inspired by the Japanese architecture of the Torii Gate. Whereas for Henry, the inspiration was in the complexity and use of elaborate joints and shaping of his table. Congratulations to past student Damian Robinson, who has won the People’s Choice Award at this years Wood Awards, for his Hex Drinks Cabinet. Damian produced the Hex cabinet as his final course project on our one year Furniture Designer Maker course. You can read the description for the Hex cabinet below, or view on the Wood Awards page here. Yesterday, our tutor Jim, demonstrated the techniques of adding stringing to a project. They are fine strips of wood used to divide areas of veneer or where the grain direction changes,y providing light or dark line. As well as being a good way to define changes in material, stringing can also be used to emphasise a shape, highlight details of a furniture’s design or delineate between something like a table top and its edging. Jim’s demonstrations covered all aspects of stringing, inlay and bandings, and he outlined the tools used to excavate the clean channels required for accurate inlay. Amongst many other techniques and methods, the students learnt handy tips, like making cross grooves using a small section of stringing to support the sides of a channel, when cutting across in the other direction. Stringing, inlay and bandings were popular decorative methods used in period furniture to make furniture designs stand out from the crowd. However, stringing isn’t a thing of the past, it is equally at home in modern furniture. Our students do often incorporate stringing, inlay and banding into their designs. This week, Wilma has been using hand skills and power tools to create stringing channels in her Walnut desk top. To enquire about this course - or other short woodworking courses - please call the office on 01984 667555 or e.mail enquiries@williamsandcleal.co.uk. There’s always a mix of feelings on a student’s last day – we are always sad to say goodbye – but equally excited to follow their progress out in the real world. 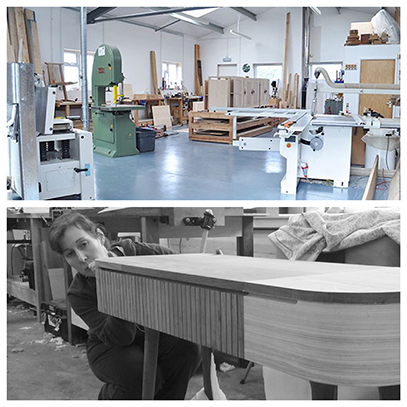 Student, Jan Lennon, has impressed us since day of her one year furniture designer maker course. Joining us from a CGI and product designer background, Jan’s ability to use drawing and 3D visualisation software to develop and plan her designs, has been nothing short of impressive. She has a natural flair for design, and she is inquisitive about a variety of technologies that has subsequently enriched her practical work. It’s been a pleasure to teach Jan the high level cabinetmaking skills to help realise her designs. So it is with great curiosity we follow Jan’s next steps. That is even easier since Jan has decided to take on bench space in the Williams and Cleal incubation workshop! We know that the start-up period for any new furniture business is costly, and it can be challenging to equip any new workshop space. The incubation workshop is part of our continuing commitment to help our students, and with the school only a few miles down the road, we are always very happy to help and advise those in the incubation workshop on their projects - even after their course. We look forward to Jan popping in for a cup of (proper) coffee to show us her future designs and projects. 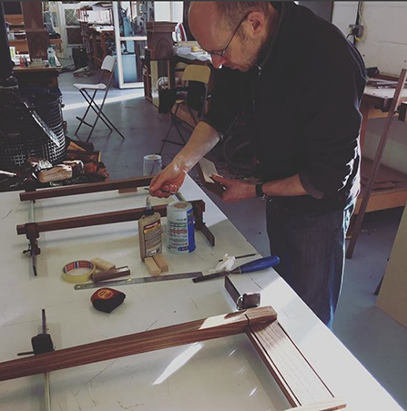 Jan will be using the incubation workshop bench space to make a wardrobe in Sweet Chestnut – and it will feature 3D printed handles depicting an alpine mountain and hut landscape. Jan will also be sharing the incubation workshop with two of our past students – Maria and Charlie – who have been operating their successful furniture business out of the incubation space for two years now. Charlie and Maria have worked hard to build up their business, Byron and Gomez, and have built up a good client base – promoting their brand at numerous exhibitions and trade shows. They have also been proactive at applying for and winning a place on craft business development schemes such as the Crafts Council’s Hothouse development programme - raising the profile of their new company within the craft community. You can find out more about Byron and Gomez at http://www.byronandgomez.co.uk/ or follow them on Instagram @byronandgomez. If you would like to find out more about our furniture making incubation workshop, or are interested in renting bench space, please contact us on 01984 667555 or enquiries@williamsandcleal.co.uk. Improving and broadening your skillset - Short bespoke woodworking courses tailored for you. Sometimes it is difficult to find a woodworking course that fits around your specific time constraints or commitments. Let’s face it, life gets busier and busier – especially if you run your own business, work full time and/or have family commitments – and it can be hard to find time to build on your skill set despite your best intentions to make time to do so. Even if you have time on your side, the issue can be finding a short course that picks up specifically on the content that you want to learn - without covering a list of skills that you are already well versed in. If this is your experience, then Williams and Cleal could be for you. We offer an unusual tailor made service - which allows students to select both the duration and content of their own course as best suits your requirements. December is shaping up to be a good month for our bespoke courses and we’ve had great interest from beginners, hobbyists and more experienced woodworkers looking to develop their cabinetmaking skills. Following this course, we’ll be welcoming an intermediate skilled student to a four day tray making course that introduces laminating, veneering, marquetry and inlay skills. Perhaps you have a specific area of your skillset that you’d like to develop further; or would like to attend one of our courses, but need the flexibility of a different attendance pattern? The best thing to do is to drop us an email or call us for an informal chat, and availability allowing, we can look to put a woodworking course together to suit. We should all make time for the things that are important in our lives, if developing your skills and knowledge as a cabinetmaker are important, then some time on our bespoke courses could be the key to unlocking further potential in your capabilities as a designer maker. Of all the optional set projects on our courses, a particular favourite is box making. Why? Well because this project, is one of the earliest opportunities for newer students to flex their design skills. This project not only brings together essential basic skills like measuring, cutting, dovetails, interpreting drawings, choosing materials and veneer - but it also offers the student design freedom with regards to veneer cutting and marquetry on the box lid. Students take inspiration from a number of sources. We’ve had Viking inspired symbology, designs in the style of Banksy, Orla Kiely inspired repeating patterns and a whole host of contemporary and more traditional box lid designs. In addition to the marquetry on the box, students are encouraged to explore a range of finishes and detail. For our student Tim, the technique of applying gold leaf in furniture making was something that he was keen to explore. Guest tutor, Maria Del Mar Gomez of Byron and Gomez, came into the furniture school to demonstrate the technique of applying gold leaf to wood. Within her business, Maria produces many pieces that feature the application of gold leaf, and she had much experience and advice to share with our furniture students on the subject. Although a seemingly straightforward process, it has a number of nail biting moments – such as when an unexpected breeze in the workshop catches the gold leaf foil…. just as you are about to place it onto the adhesive! Maria taught our furniture students best practice in Gold Leafing, from application through to burnishing and sealing. Then it was Tim’s turn to have a go (pictured!). Gold leaf was the perfect choice to compliment the rich tones of Tim’s sunburst veneered box lid. Box making is an optional set project on our 40 week Fine Furniture Making course - but did you know that you could also opt to make it on our bespoke furniture programmes? Depending on how complex you want your box design to be and your making speed, it could be achieved on a 5 – 6 week bespoke course. Interested? Give us a call to find out more - or contact us here. What will your box lid design be?